Fulla’s tomb, located in the cemetery in Ružomberok and designed by Martin Kusý, is also under the administration of the Slovak National Gallery. Fulla himself designed the interior mosaics and Ernest Zmeták designed and created the mosaic on the floor. The tomb was built as a gallery (for Fulla’s first wife). Its shape is a simple prism made of monolithic concrete. 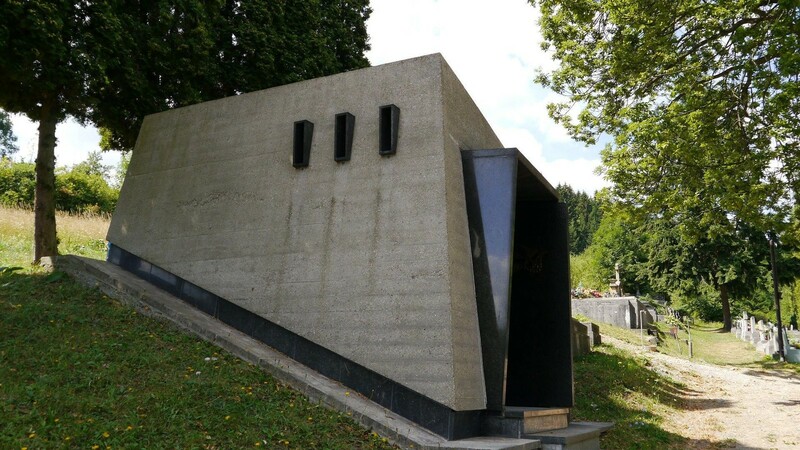 For this reason, the people of Ružomberok called it the “Bunker.” However, the interior is extremely ornamental, with two mosaics of bright colors along with a golden inscription. Their form resembles the traditions of early Christian and Eastern art. The architect created a neo-Expressionist sculpture as a place of rest for the artist, a brutalist structure with carefully designed accessories (for example, the door handle – an enamel motif of Fulla’s little bird). However, there were problems; today’s tomb is in fact the second one. Fulla ordered the first structure taken down because of the poor quality of the concrete work.